COMPANY PROFILE Itau Unibanco Holding SA operates through banks. Its services comprise of investment banking, credit card, financing, leasing, and foreign trade financing. Itau Unibanco is the largest privately held bank in Brazil and the result of the 2008 merger between Banco Itau and Unibanco. In addition to Brazil, the bank has significant operations in Chile, Colombia, Argentina, Uruguay, and Paraguay. The bank’s commercial and consumer loans each account for about 37% of the bank’s total loans, while Itau’s foreign loans now account for nearly 26% of the bank’s portfolio. In addition to banking, Itau operates the fourth largest insurer in Brazil, and it specializes in consumer related insurance. 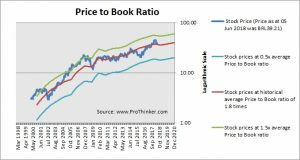 At the price of BRL39.21 as at 05 Jun 2018, Itau Unibanco Holding Sa is trading at a Price to Book Ratio of 1.9 times current book value. 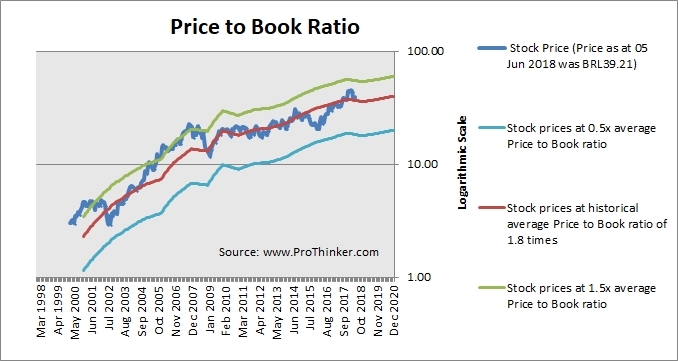 This is a 7% premium to its historical average Price to Book Ratio of 1.8 times.